Premier Style pedestal park benches are a great addition to any surrounding. The comfortable contours provide classic good looks and rugged durability. 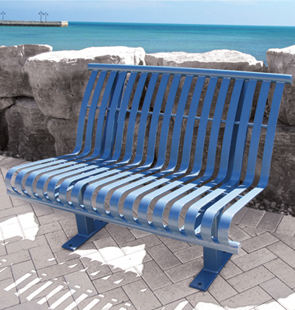 Ribbed steel back/seats are ideal for beach areas, allowing water to filter through to keep the bench in top condition. The pedestal frame makes it easy to maintain, and the lack of armrests gives this bench a clean and modern look. The fully welded, all-steel construction requires no assembly, and the thermally bonded powder-coating assures long-lasting beauty. Models available with or without backs, in 4' and 6'. 2-1/2" x 1/8" Wall Square Steel Tube Legs.